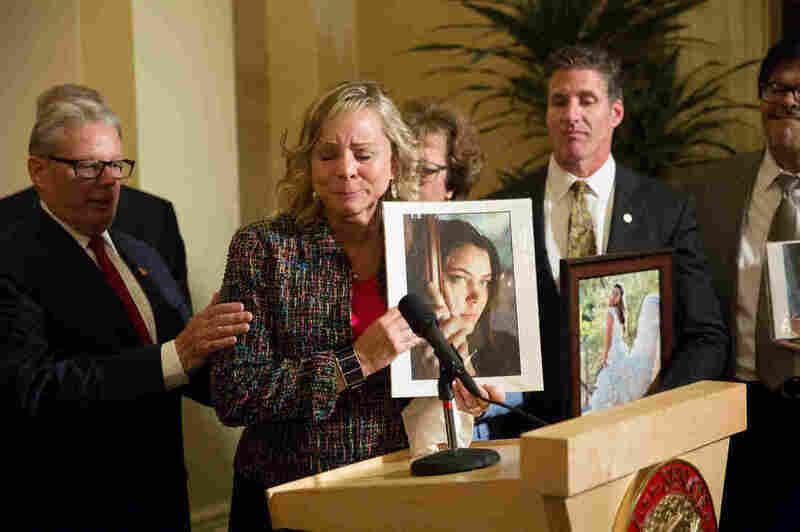 California To Permit Medically Assisted Suicide As Of June 9 : Shots - Health News Terminally ill Californians will legally be able to get medicine from doctors to end their own lives. The end of the state's special legislative session Thursday made it official. "We're glad to finally have arrived at this day where we have a date certain," says Sen. Bill Monning, D-Carmel. "It's a historic achievement for California, and for a limited universe of people dealing with a terminal illness," Monning says. "It could indeed be a transformative way of giving them the option of a compassionate end-of-life process." "We are looking ahead at measures to protect people from abuse," Golden says, "and to explore and inform doctors, nurses and pharmacists that they don't have to participate." "It gives me a great peace of mind to know that I will not be forced to die slowly and painfully," says Elizabeth Wallner, in a release from Compassion & Choices, an aid-in-dying advocacy group. Wallner, 52, of Sacramento, is a single mother with stage 4 colon cancer that has spread to her liver and lungs. "It gives great comfort to know that the agonizingly traumatic image of me suffering will not be my family's last memory of me," she says. Christy O'Donnell, 47, of Los Angeles, died of lung cancer last month. "I really believe," Monning says, "we use today to mark and dedicate the memory of some true champions."